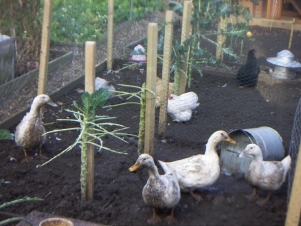 The addition of our four Aylesbury Ducks came about after Derrick had noticed whilst looking for further accommodation for our chickens that they also housed ducks. This got his mind ticking over (this happens practically constantly.....the man never stops! Mind you most of his ideas are good......) and he began to imagine the back garden as being more ornamental due to the growing room we have on the allotment and that it would complete the look to have some ducks waddling about. He began to investigate and came across an advert on the Pre-Loved website for the four Aylesbury Ducks. A local small holder was re-homing them due to not having enough time to give them the attention they deserved. He already has rather a lot of chickens to look after and with young children he has his hands full! Derrick registered his interest and the man kindly agreed to hang onto them for us while Derrick prepared their new quarters and got everything ready for their arrival. New Duck House in place, we went to pick them up. Megan and my Mum came to assist and we watched in amusement as Derrick and the other gentleman tried to capture them into the pet carrier for transportation. Lots of quacking and flying feathers! More quacking ensued on the car journey home making both Megan and my Mum giggle all the way. Back home Derrick, myself and Megan released them into their new home with my Mum keeping a safe distance watching the commotion from the lounge window with an amused smile! After an initial half an hour of them looking a bit dazed and confused they soon found the water set down for them and wandered around to have an explore. They were being watched by some very inquisitive Bantam’s. “Who are these and what are doing here?” You could practically hear them thinking! They are very nervous little characters and lots of quacking goes on whenever you walk past the pen. They stay huddled together in their little foursome. Very cute! They enjoy the mud! At this moment in time they are brown ducks rather than white! As time has gone on the ducks have settled in nicely. Although they are somewhat noisier than we anticipated, quacking away every time someone walks past. The Bantams appeared unfazed by the ducks and vice versa. So Derrick decided to remove the dividing wire fencing. Things seemed fine for quite few days until we noticed the bantams behaviour towards them change. They appeared to be divided them and circling one that they had cut off from the others. Then Pudding the black bantam was trying to get onto it’s back and pecking it around the head. “Enough! We won’t be having that!” was Derricks response and the divide went up again. Naughty little bantams! The ducks were once again left alone in peace. Meanwhile on the allotment, two of our fresh start batteries were being picked on by the others. They were rather pathetic looking creatures, very skinny and bald. Which is how they were when we got them. They didn’t have much of a chance to get stronger due to the pecking order and not being allowed to get to the food. By the time they got there it was nearly all gone! So Derrick decided to see if they would get on with the ducks and try to give them a fighting chance, to get them stronger so that they could hold their own against the bigger batteries. He kept a close eye on how things developed with them, but they seemed to get on fine, the ducks not really paying much mind to the new room- mates. The chickens? Just looked relieved to be free from terrorism! Hee Hee! A week or 2 passsed and they lived in harmony. With the chickens eating much more as they didn’t have to fight for scraps and looking much more relaxed. Eventually though, one of them, the slightly stronger one of the two to begin with, had started to behave towards the ducks as the bantams had. Cornering them and circling. It was making the ducks even more nervous than usual! So it was back to the allotment with her! Derrick monitored things and she got on much better with her new found strength and confidence. So it was one chicken left with the four ducks. A few weeks after this, Derrick decided that he would try the last remaining chicken back down the allotment to see how she would get on. She was much bigger thanks to the bigger portions of food and had regained her plumage. And....she had started to lay eggs! Something she had not done since coming here. She was a different chicken! Bless her! Rehabilitated, she is getting on just fine with her fellow batteries now. She is still last in the pecking order but can hold her own and looks happy. So, back to the ducks (those chickens really steal the show don’t they?! Ha Ha!). It was becoming clear that they were not going to calm down as it were. They just acted so nervous all the time, whenever anyone walked past or at loud noises. Especially the sea gulls! Which is a problem in Bridlington.......coz they are everywhere! Imagine in the summer when they were in full force?! The deciding factor was when Megan said she could hear them round the front of the house on her way home from school. Hearing this for himself a few days later, Derrick decided it was time to find a new home for these webbed feet neurotics! If they were this loud in winter, they would be worse in the Summer and the neighbours would not be amused. No, in a built up residential area it was not going to work. So they were advertised on the Pre-Loved website and were eventually taken on Christmas Eve as a Christmas present/house warming gift by a friend of someone who had just taken on a small farm. Much more suitable for them. They are doing just fine. We received a text that evening to say they had settled in and even laid their first egg in their new home! So it was Happy Christmas Aylesbury Ducks who had spent a couple of happy months waddling around Priory Cottage and helped to rehabilitate “Bluey” and “Greeny” the poorly chickens. Not to mention providing us with a healthy supply of gorgeous yolky eggs which we had boiled with soldiers on many Sunday mornings. Thank you and you will be missed. That brings us to the second week of January 2014. Derrick still wants some ducks here but much smaller and.......quieter! So he has done his research and has sourced a breed that is suitable. Never one to sit and wait, he has paid for two Campbell ducks, white ones which we are picking up this weekend from Smiths Nurseries, the same place where we got the Bantams. An update and photo will follow once the new comers are settled! Watch this space.............!